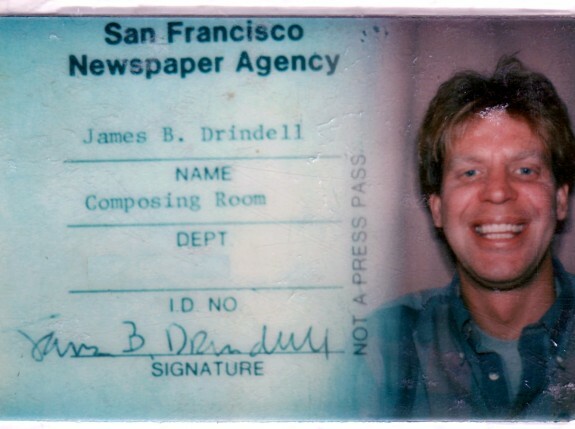 Jim Drindell, union member and beloved friend, worked as a composer for the San Francisco Newspaper Agency, as depicted in this photo ID. Photo courtesy Stephanie Hedgecoke 2014. Jim Drindell, longtime member of the Bay Area Typographical Union Local 21 and later our merged union, died on June 10. His dear friend Stephanie Hedgecoke, also a longtime member of BATU, wrote this tribute. It was around the Christmas holiday of 2010 that Jim went home after rehab following the abdominal aneurysm. He was housebound the last few years, and on oxygen. He was in a lot of pain. I first met Jim in Amarillo when we were teenagers. He quickly became my best friend, and he taught me so much. He was like a big brother. He urged me to try to get a transfer from the Amarillo Daily News mailroom to composition, as I had already learned proofreading and some paste-up layout working on my high school newspaper. Once I accomplished getting the only transfer out of that mailroom ever, we were working second shift Thursdays through Mondays. Jim began to teach me about unions, he was from a pro-union family, and he introduced me to the remaining working members of the Amarillo Typographical Union. They had not had a contract since they’d been threatened with a shotgun-carrying new boss from the Oklahoma scab school in the 1950s after Taft-Hartley passed, but a few were still in the shop and they took every opportunity to speak to the youth working alongside them about the Typographical Union. Long story short, they organized us off the shop floor! We had a meeting with the other workers about unionizing the shop, but the others were fearful of being fired from the only composing room for 300 miles. We took their advice, took our first Traveler’s Cards, moved west and slipped up at the Albuquerque Journal as substitutes in August 1975. Jim was likely the very first out gay man they had met at that shop and the guys had to quickly learn to respect him. That was where we met Ken Prairie in our first experience getting a new contract. I corresponded with him and gave him contacts at the newspaper in Austin, Texas. Jim and I went to the ITU Training Center in Colorado Springs (that was my second spell there) for nine weeks in the summer of 1977. Greatest trade school ever! And we had some wild times in Colorado Springs and Manitou Springs back then. We were flat broke when we left and just barely made it back to Albuquerque, having to replace a fan belt on the car in a small town in northern New Mexico after hours. Jim convinced me we should follow a friend out to San Francisco; he moved there in 1978 and I arrived in May of 1979. I slipped up in Richmond at the Independent. There I met Valerie McDonald who along with her husband John exercised our ITU rights to get Local 21 to open to substitutes. The three of us showed up the first morning (September 1979) at the Local HQ to deposit our cards. Jim deposited his card a couple weeks later and we both slipped up at the San Francisco Newspaper Agency. Back then it was the BEST SHOP EVER. There were some 800 situations and 69 substitutes. It was very exciting. We sometimes rode with carloads of other substitutes to pull picket duty in Vallejo as the strike was still going on at that time. I followed Jim over to Sorg of San Francisco about a year and a half later. All our remaining members and retirees who worked at Sorg will remember Jimmy. Those were good days and another great shop. Great chapel, too. We all went to the Local meeting when the Bowne Chapel was under attack and strongly spoke against giving in to the bosses’ demands. Later the Sorg Chapel joined the Bowne Chapel picketline. Jimmy met his boyfriend/domestic partner Bob Stanton for the second time at the 1981 Solidarity Day demonstration to support the PATCO (air traffic controller) strikers. I saw their faces. It was historic for them. Although Jimmy was sick and in pain for a long time, it still was a shock to hear he left us June 10th. I owe him so much. If I had never made friends with Jimmy, I don’t believe I would have had the opportunity to join the union, to get out of Texas, to live and work in San Francisco and to have so many rich experiences in the union, the labor work and more. In short, my life totally changed for the best as a result of my best friend, Jim Drindell.